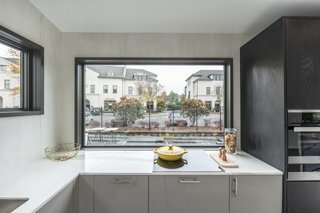 When designing or remodeling your kitchen, one of the most important elements you’ll need to consider is the surface material for your kitchen island and countertops. 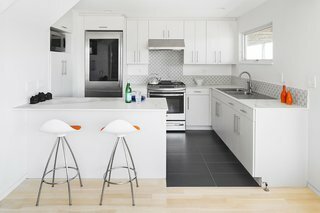 While one of the most sought-after materials for kitchen worktops is marble, it’s wise to be aware of both the pros and cons of this option before you decide. 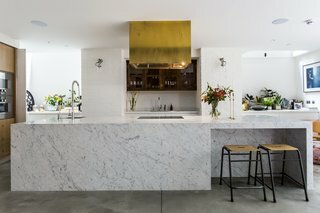 The most obvious advantages of marble are its timeless appeal, premium texture, flexibility; because each slab of marble is unique, you can choose between a range of colors and veining for a highly personalized work surface. Marble, however, does have a number of drawbacks. Because it's a natural product, it is porous, and stains easily. 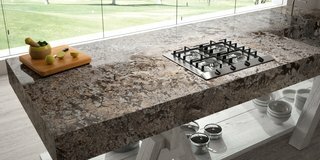 It's also much softer and more brittle than granite or manufactured stones, and will require sealing every six to 12 months. 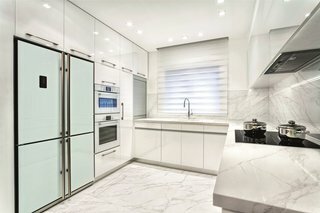 Marble also reveals wear and tear more obviously than most other kitchen surface materials. Of course, one of the biggest downsides of marble is that it’s expensive, costing significantly more than most other kitchen worktop materials. 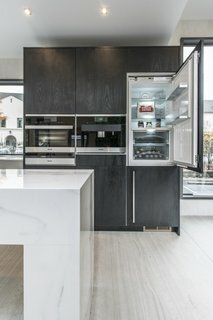 Neolith countertops in the open kitchen and details like the flush minimal baseboard contribute to the sleek, modern aesthetic, now complemented by the owner’s contemporary furnishings. Thankfully, technological advances have made it possible to recreate the opulent sheen and intricate patterns of marble in other kitchen surface materials. We take a look at some gorgeous, durable, and more affordable alternatives to marble. More heat-resistant than marble, granite is a durable, igneous rock that can give your kitchen a natural look that's similar to marble. The downside with granite is that it’s also porous like marble, which can result in staining over time. To avoid this problem, try Consentino’s Sensa range of stain-resistant natural granite surfaces, which has been treated to protect against liquid penetration. Quartz is a hardy mineral that looks and feels like natural stone, but is non-porous, and does not require the same level of maintenance. 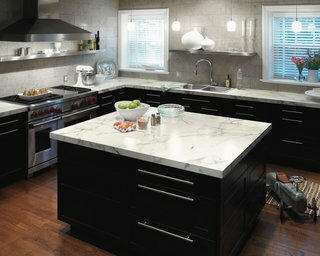 Composed mostly of crushed quartz and resin, quartz surfaces such as those available from Caesarstone are made with up to 93 percent natural quartz, and come in a range of patterns that mimic marble. Using a sintering technology that fuses ceramic, porcelain, quartz, feldspar, glass, and silica, sintered stone surfaces such as those from Neolith offer extremely durable, stone-like surfaces in a wide range of colors, effects, and finishes. Highly impact-, scratch-, stain-, and bacteria-resistant, sintered stone holds up well under high temperatures, so it's ideal for kitchens. Solid surfaces are composites made up of synthetic materials like acrylic, mineral dust, and resin that can be combined to look like natural stone. Not only are solid surfaces non-porous and highly stain resistant, but they're also created through thermoforming to fit specific shapes, which is ideal for curved counters and worktops. 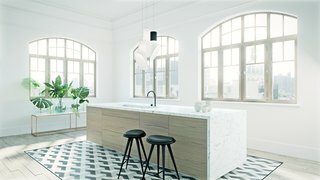 One of the most popular solid surface brands is Corian, which offers a wide range of surfaces with gorgeous marble effects. 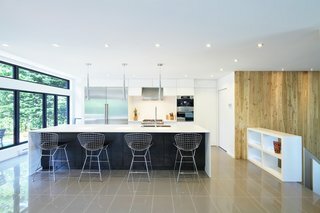 The kitchen features a wide Corian countertop and Bertoia stools. The polished ceramic flooring is from Céramique Décor in Québec. Scratch-, heat-, bacteria-, and stain-resistant, ceramics allow you to chop your vegetables and prepare your food directly on your countertop. Because it holds up well against humidity, a ceramic worktop is a great choice for outdoor kitchens. 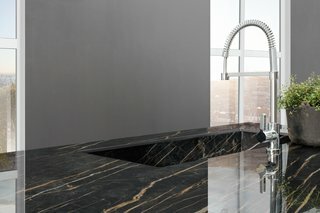 Italian ceramic brand Laminam offers a range of elegant, marble-inspired ceramic countertops that let you enjoy the beauty of marble at a much lower cost. Affordable and easy to install, laminate surfaces are a wise choice if you like to remodel your kitchen every couple of years. Easy to clean and resistant to chipping or scratching, Formica offers efficient laminate surfaces with marble patterns.